What is the role of the First Violist? An orchestra is made up of families of instruments: the woodwinds; the strings; the brass family and the percussion family. The string family of instruments is divided even further, with assigned roles to each member. Generally, the strings are made up of the first violinist, the second violinist, the viola, the cello and the double bass. The role of the first violinist is an important one, and a music director doesn’t take the appointment lightly. The first violinist requires excellent musicianship, as well as the ability to carry the family of instruments in an orchestra. One could say the first violinist sets the tone for the entire orchestra, making the position a coveted one for professional musicians. In the United States the first violinist is often called the concertmaster, but in other parts of the world the position may just be referred to as the leader, or the first violinist. In general, the first violinist, or the concertmaster, carries the tune or the melody of a particular piece of music, while the second violinist plays the harmony. In a professional orchestra, the position of first violinist is usually paid more than other members of the orchestra. One reason is that the first violinist is often in charge of musical solos, and the position may also require an individual to take charge of the bowings for the string instruments. In a professional setting, the first violinist may even provide orchestra leadership when the music director is away. In a school orchestra, competition for first violinist is often as competitive as in the professional world, and violinist may have to audition for the part. However, it should be noted that some orchestra leaders may rotate the position among violinists, to give everyone a chance to showcase their talents and leadership abilities. While the role of the first violinist is important, the second violinist is also a necessary component to an orchestra’s string section. Without the second violinist, orchestra music would be rather boring, and some violinists actually prefer to play harmony over melody. Unfortunately, in the music world a certain snobbery may exist regarding the roles of both the first and second violinists. 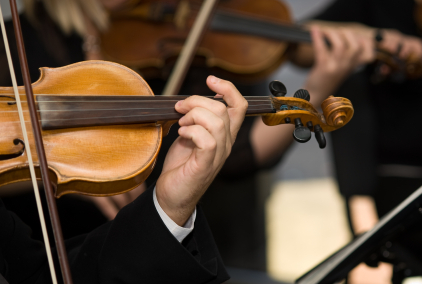 Music students and professional musicians often underestimate the role of the second violinist, and music directors may find that students who don’t make first violinist may need inspiring to help them reach their goal. In sum, a competent music director will make it clear to his or her musicians that every role in an orchestra is an important one, and that certain roles, such as first violinist, can be achieved through dedication, practice and patience.